When it comes to the time of year when the Crann Tara personality of the year has to be finally chosen it is always a close run affair as there are numerous potential candidates who could be considered for this accolade, so more often than not there are only one or two votes separating the winner from second, but as always there can be only one as quoted from the movie “Highlander”. As always when determining who is our chosen personality of the year we take the matter seriously including considerations to what that person or persons have done over their life time for Scotland. This year’s winner of the award was again chosen from numerous potential candidates, all of who had shown everything that was deemed essential and necessary in all aspects of promoting Scotland to be included in the running for the award. What makes this award special is we only present it once every year, which is unfortunate as there are so many worthy of it. This year’s winner is undoubtedly worthy of being recognised by us at Crann Tara for his relentless work in promoting Scotland. Having a passion for his country, his voice has been heard through political sentiments in courts and via the internet, his rebellious nature lead to him taking direct action in leading others to raise the passion and patriotism of the Scottish people in the 1950’s. In words of the Declaration of Arbroath where the Declaration intimates that “SO LONG AS 100 OF US REMAIN ALIVE” the country will remain in safe hands, our winner this year would certainly be, one of that hundred. Ian Hamilton was born in Paisley, Scotland 13th September 1925. He attended the John Neilson Educational Institution at Oakshawhead, Paisley, a school for boys, before going onto University at both Edinburgh and Glasgow. It was during his time at the University of Glasgow that Ian became politically active in the Glasgow University Scottish Nationalist Association and the Scottish Covenant Association. He was also the campaign manager for the successful bid to have John MacCormick elected Rector of the University. Ian Hamilton first came to prominence on Christmas Eve 1950, Hamilton, for his part along with Kaye Matheson, Alan Stewart and Gavin Vernon other student Scottish nationalists, liberated the Stone of Scone from its place under the Coronation Chair in Westminster Abbey, London. In 1953 two years after the events regarding the Stone of Destiny, Ian was first admitted to the bar as a young advocate Hamilton where on having to swear oaths he refused to swear allegiance to Queen Elizabeth II arguing that she could only be referred to as "Queen Elizabeth" as in Scotland the regnal numbers counted Queen Elizabeth I, who had not ruled over Scotland or any of the subsequent united kingdoms which it has entered into. This developed into legal action being raised against the Lord Advocate. MacCormick v Lord Advocate (1953 SC 396) was a Scottish legal action in which John MacCormick (the Rector of the University of Glasgow) and Ian Hamilton (then part of the Glasgow University Scottish Nationalist Association) contesting the right of Queen Elizabeth II to style herself ‘Elizabeth II’ within Scotland. They claimed it was a breach of the Act of Union 1707 between England and Scotland, since Queen Elizabeth I had been Queen of England but not of Scotland. (A historic example of a numeric distinction is found in King James I of England, who was King James VI of Scotland.) The action was brought against the Lord Advocate the most senior legal representative in Scotland. Unfortunately this case was lost, but the outcome of their case is still holding a continuing relevance today more so since the Scottish Parliament was reinstated in 2000. Ian has spent most of his life in active politics as a member of the Scottish National Party (SNP). He was SNP candidate for the Strathclyde East seat at the 1994 election to the European Parliament, as well as a candidate for the SNP in the Greenock and Inverclyde seat at the 1999 election to the Scottish Parliament. 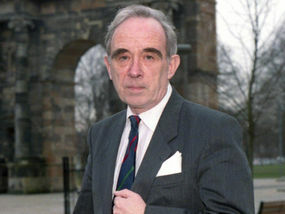 He was Rector of the University of Aberdeen from 1994–1996 and was awarded the degree of Doctor of Laws (Honoris Causa) in his final year. He was also chosen by the Glasgow University Scottish Nationalist Association as their candidate for the Glasgow University Rectorial election in 1999 in which he came second to the actor, Ross Kemp. Ian has written two autobiographical works that are also in part polemical, A Touch of Treason (1990) and A Touch More Treason (1994). He has launched a blog, http://www.ianhamiltonqc.com/blog/ where he posts commentary on Scottish social and political life. This blog newspaper was started on 20th October 2006 which obtains a huge amount of interest and rising steadily to this very day. Ian’s blog is now the largest politically incorrect Scottish comment on the web. It is edited by himself, along with another two people, Mike Mackenzie and David Balfour both Scottish Nationalists. Ian likes to be known as a troublemaker as he states “that there are times when our country needs troublemakers” and claims he is one. Ian received the Lifetime Achievement Award at the Law Awards of Scotland in 2009. Receiving the Crann Tara personality of the Year award for 2010 is quite a small accolade in the scheme of what Ian has achieved in his life time and something that as a Scot we would only dream of achieving, but never the less we in Crann Tara present the award like we have in previous years to those who have given so much for Scotland and makes sure that they are not only never forgotten, but continue to be recognised for their efforts.